This friendship is remarkable as these zodiac opposites have a very special way of making things work between them as buddies. While the Aries and the Libra are opposing each other from an astrological point of view, they can still become friends very fast. The Aries admires how the Libra is graceful, stylish and funny, while the other way around, the latter truly likes how determined to take part in new adventures and always courageous their friend is. 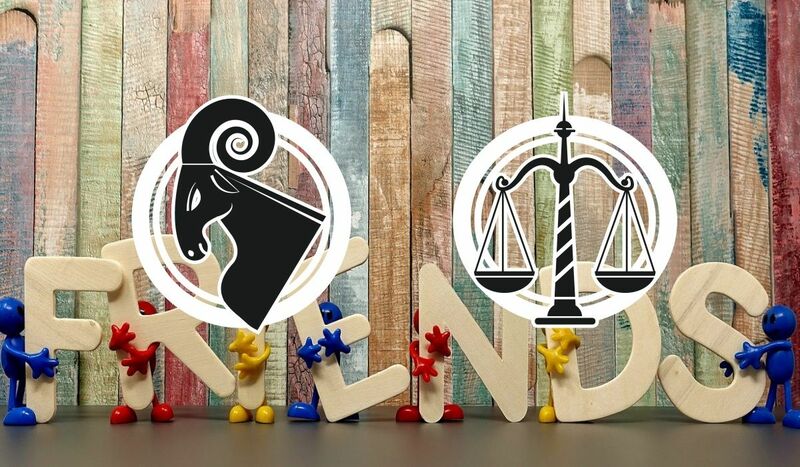 Of course, the friendship between these two will sometimes be challenging because the Aries can get hurt seeing the Libra is flighty, while the latter may not like the way the former is pushy. However, these two can easily make up and neither of them likes to hold a grudge. The Aries is independent, the Libra loves to collaborate, which means the friendship between them can be very funny. The Ram will always try and convince the Libra to live more on the edge and to deal with criticism in a more direct manner. In return, the Libra will advise the Aries to just slow down a little bit and to appreciate life at a steadier pace. While they’re weird as friends, these two can really work very efficiently together because the Aries can learn from the Libra how to be more diplomatic and the Libra becomes more assertive when seeing this in the Aries. They may do different things because the Ram wants to enjoy sports and the Libra prefers to go to the museum, but this won’t be a problem for their friendship. As said before, these signs are opposing each other on the zodiac wheel, and their constellations are positioned at 180 degrees, things that are also noticeable in their personalities because each of them has what the other lacks. For example, Libras are only interested in peace and harmony, Arieses don’t mind fighting from time to time. However, the opposition between them gives their friendship harmony through complementarity. The Aries acts impulsively and wants all the time to be excited or to get things done on the spot. The Libra takes a lot of time to decide and prefers to look for the peace and calm in everything. It seems opposites really attract because these two can be great friends. As a matter of fact, all Arieses always seem to make great friendships with any sign, even if they can also sometimes initiate arguments. However, the Aries and the Libra opposing each other need to truly understand what the strong points of their connection are, especially if they don’t want to end up in a rut. It can be said the friendship between the Aries and the Libra is balanced because the Libra has charm, is cultured and mannered, so he or she can truly teach the Aries how to no longer be so harsh. In return, the Aries has great will and determination, which compensates the indecisiveness of the Libra. Therefore, the Aries can always help the Libra be more exciting and make decisions much faster, while the Libra can show the Aries he or she doesn’t really know everything. The Aries is ruled by Mars, which stands for masculinity, whereas the Libra is governed by Venus, the planet of femininity. In conclusion, these two signs complement one another because the balance between them is between two major energies. The Aries belongs to the Fire element and the Libra to the Air one. Since air keeps the fire burning, the Libra is as well fascinated by the force of the Aries. In return, the Ram will be charmed to notice the refined Libra every day. It’s essential these two collaborate in everything they’re doing, even if this can be a little bit difficult because they’re opposite signs and therefore, very different personalities. For example, the Aries can be too energetic and impulsive for the kind and balanced Libra. However, if they manage to work together, they can achieve great things, especially if good friends. Both of them are cardinal signs, which means they’re good at taking the initiative, even if they may pull in opposite directions. The Aries usually leads by taking action, while the Libra is an intellectual who analyzes things. Both of them love being leaders, but the Aries may insist on playing the boss card and dominating any partnership. The Libra has a different strategy because he or she uses charisma and gets others to obey him or her. Because they both want power, it’s possible for them to sometimes fight, so compromises in their partnership are absolutely necessary. Because the Libra usually sees all the different sides of an issue, he or she is more likely to give in when arguing, not to mention Libras really want peace and usually prefer to compromise than to contradict. The Aries loves to be the boss and doesn’t mind taking on responsibilities. On the other hand, the Libra doesn’t want for others to give him or her attention, but to mediate. Therefore, a Libra may find their friend to be exaggeratedly tensed. However, the Libra can also make the Ram softer. When not having enough power to take the initiative, the Libra can be helped by the Aries to have higher spirits. Therefore, the Ram can help the Libra to make decisions more rapidly by being supportive. He or she really knows how to handle insecurity and indecisiveness. The Aries loves to be involved in new adventures and the Libra doesn’t mind accompanying him or her. The fact that the Libra is communicative can keep the Aries interested and curious. Furthermore, the former always prefers to have an optimistic attitude, even when the latter gets to be pessimistic. Therefore, the Libra can help the Aries smile in difficult situations, which makes the friendship between these two valuable, long-lasting and steady. It’s better for them to not fall in love with one another when good friends because they’d only spoil a good thing they’re already having together. What’s truly remarkable about their connection is the fact that the masculine energy of Mars combines with the femininity of Venus. It’s a balance between two opposites, between the self and the other. The Aries and the Libra can learn many things from one another because their personalities are complementing and the balance of their friendship can’t be in any way tampered with. The Aries is very energetic and can change his or her interests from one minute to the other. It’s good to be friends with the Ram because this character is always intense, even if he or she may often change opinions and is usually picky when choosing friends. People born in this sign have many acquaintances because they’re all the time interested in something new and many can’t keep up with them. Taking risks and being unpredictable is something they’re doing everyday, so it’s easy for them to make new friends and to be present at as many events as possible. The fact that they’re independent can be a little bit annoying for their lovers, but they’re not bothered by this because they just want to be around their friends and people who can truly appreciate them for whom they are. Arieses never need too many companions to go out because they can have great fun with only a few individuals who think just like them. They’re always doing something adventurous, interesting and joyful because they’re entertaining and hate getting bored. While all Fire signs are not known as sensitive with their friends, Arieses surely are loyal. It’s possible for them to forget about birthdays and special anniversaries, but they surely remember other details about what makes a friendship important. Very honest, the Aries can say hurtful things that are most of the time true. He or she loves arguing and never holds a grudge, regardless how intense his or her fights may have been. The Libra loves socializing, going to parties, living the good life and being surrounded by his or her loved ones. As a matter of fact, the Libra is only interested in communicating with others and having many friends. People in this sign are very devoted companions and don’t mind working hard for their partnerships to resist in time. They are those to whom everyone turns to for advice because they can truly analyze situations in an objective manner and are usually impartial. When offering their opinion, they’re diplomatic so no one around them gets hurt hearing the harsh truth. The Libra doesn’t mind communicating and even having contradictory discussions with friends, but he or she would hate to know someone involved in the conversation is not having any fun. Natives of this sign need their own space, so it’s better for their friends to leave them alone when seeing that they need some time for themselves. They can become very annoying and nasty when bothered during their alone time. The worst type of Libras are manipulative, lazy and self-centered. However, most of them are honest, friendly and very sociable because they simply love to only live amongst their friends. Their loyalty is incredible as they pay great attention to the ones they love and they’d never judge without seeing all the sides of a story. People turn to them for advice and at parties, they can really keep the atmosphere alive. As said before, Libras need to be given their own space by their friends or else they become truly ugly when it comes to their behavior.